At the age of 62, travelling abroad no longer excites me as much as it did before. Besides, I feel God has granted me so many precious moments as a traveller already. As a family, we were in Rome for the canonization of our first Filipino saint, San Lorenzo Ruiz. During Jubilee Year 2000, we went to Rome to attend World Youth Day with a group of parish youth. Such energy and exuberance of the young people! We went to Turin to view the Holy Shroud and proceeded on a tour to several countries, the shrine in Lourdes included. We have gone to Eastern Europe also and spent quiet moments praying to the regal Our Lady of Czestochowa in Poland. I have not expected I would be able to travel abroad (I have low expectations!) and therefore, have been contented with the travelling I have done. Past 60 years, I no longer dream of foreign travel, especially since I detest the cold weather in other countries and my knees have weakened considerably. But one day, in the remote town of Morong, Bataan,as I gazed at the statue of Our Lady of the Pillar, the patroness of the parish church, I felt child-like enough to ask Our Lady: can you perhaps extend an “invitation” to me to visit your shrine in Spain? I just felt she had to “invite” me for me to be able to undertake the trip. How on earth it would materialize – I just did not give it a further thought! Indeed we felt called especially since there were just 11 of us in the group and without the three of us (my husband, me, my daughter), would the travel agency have pushed through with this? With the lack of financial rewards for the travel agency and the early emphasis on confession, I observed wryly: “This seems to be a real pilgrimage!” I had gone on a trip before which the organizers said was a pilgrimage but at the same time not to be emphasized as such, they said, because the other participants might not join anymore! There were three priests in the group then but all of them failed to bring their missal and other items for the Holy Mass! 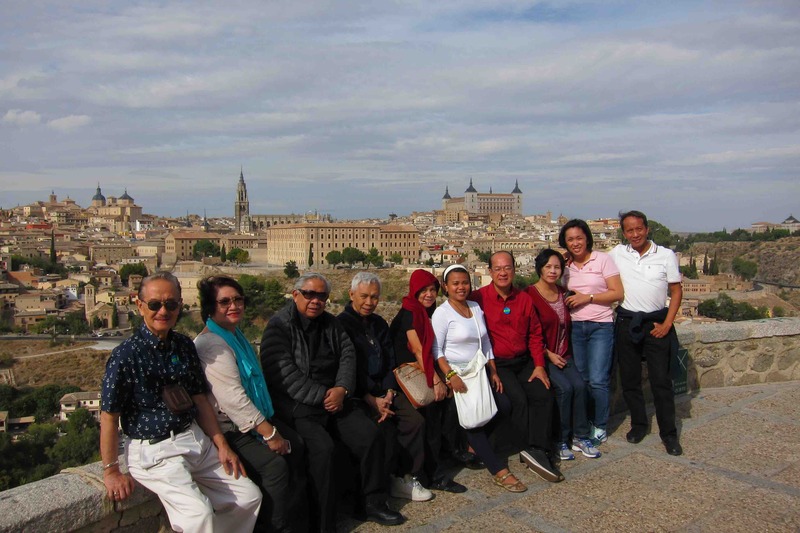 In this particular trip, the presence of Bishop Martirez was quite a blessing and the tour coordinator, Millard Villaverde, was quite skilled in his job, not only as a tour coordinator, but more so, as a worthy assistant of the Bishop in the spiritual aspects of the journey. What was noteworthy also was that all of us in the group seemed to like the spiritual overtones of the trip : the morning prayers in the bus, the Holy Masses (not in hotel rooms, but in the churches we visited), the constant reminders of Bro. Millard to pray especially to gain the indulgences and even the sharing in the bus when we all would rather have dozed off. I remember that one time we said the Three O’clock Prayer in the midst of a crowded restaurant in Santiago de Compostela! Fatima and Lourdes are the two greatest shrines in the world today. Pilgrims go to Lourdes for the healing but many do not realize that it is here that Our Lady affirmed to the world a dogma proclaimed four years earlier. “I am the Immaculate Conception” she said to the illiterate peasant girl, Bernadette. Thereafter, how can one dispute that Our Lady was born and conceived without the stain of original sin? I have always been intrigued by Fatima. It contains grave messages of Our Lady for our times, notably the conversion of Russia. I have read books on it and despite the revelation of the Third Secret in the year 2000, I am one of those who, deep in my heart, still ask if indeed the Third Secret was revealed in its entirety. On the road to Fatima, I already felt being tugged at my heartstrings as I learned from Bro. Millard that he would arrange for some of us to participate in the International Rosary. During the actual Rosary in Fatima where my husband and I said 5 Tagalog Hail Marys, I simply broke into tears, so overwhelmed was I of the moment. I have always been a fervent devotee of Our Lady, I am adviser of a Marian youth group in our parish, I used to be at the forefront of “Totus Tuus Maria magazine” and suddenly, she seemed so near! You know how it is when all the difficulties, trials, and joys of many years (since 1982 for me) suddenly come to the fore and rush upon you with a realization of how your life has been lived - in the spirit of “Totus Tuus, Maria” or “Totally Yours, Mary”. You just break into tears. In Fatima, Bro. Millard arranged that our private Mass could be held at the Chapel of the Apparitions but we would have to make a sacrifice : the Mass would be at 5:30 a.m. Well, we had to walk early morning in the cold (below 10 degrees we were told ) but it was worth it, of course. In Lourdes later (the narration of events here is not in chronological order), we all again were blessed to actively participate in the International Rosary – either as leaders saying the Tagalog Hail Marys or part of the Filipino choir singing the Tagalog Immaculate Mother. Despite this being my second visit to Lourdes already, I still shed a few tears watching the beautiful scene: Our Lady glowing in the light of so many candles with a rousing “Ave, ave, ave Maria” being sung and so many Hail Marys said in various languages I could not even identify! Our stay in Lourdes was capped with a Mass in the Grotto itself where Bishop Martirez was the principal celebrant and some foreign priests concelebrated. Not satisfied with a Mass in any of the side chapels, Bro. Millard was able to arrange the Mass to be held at the grotto itself. Here’s a funny incident. Before the Mass, we (my husband, daughter and I) were assigned to do the Offertory collection. But there were no baskets. By chance (I believe it is Divine Providence), there were three Africans in front of us with big African hats tied to their backs. They spoke English, we borrowed their hats for the collection, and told them after the hats had become “blessed” hats! The collection was generous and may the “blessed” hats bring material and spiritual blessings for those three Africans! Any pilgrimage to Spain would be incomplete without a visit to Santiago de Compostela where you find the Shrine of St. James, the patron saint of Spain. St. James is usually called St. James, the “Greater” to distinguish him from another James, called the “Less”. He was one of the Apostles of Jesus and the brother of the more popular John, the beloved disciple who took care of Mary and stood with her by the Cross. According to ancient tradition, in AD 40, the Mother of Jesus appeared to James on the bank of the Ebro River while he was preaching the Gospel in Spain. It is said that the Virgin Mary was still alive at this time. Mary told a disheartened James not to be discouraged about evangelizing Spain because the faith of that country would be as strong as the pillar she was standing on. History proves true as the faith of Spain reached our very own Philippine Islands in 1521 under Ferdinand Magellan. The Blessed Mother here is thus called Our Lady of the Pillar. While her story is closely entwined with that of St. James, her shrine nevertheless is in Zaragoza, Spain with the piece of the pillar she was standing on still venerated and preserved in her Basilica (which we likewise visited). There is so much to write about Santiago de Compostela, like the traditional pilgrimage to the grave of the saint known as the “Way of St. James”. But that would merit another article. Well, we did not of course take the 100-kilometer walk as we rode in an air-conditioned bus (11 in a bus for 50)! But I am glad to say that we heard two Masses that day. We had our own private Mass with Bishop Martirez at 10 am in one of the side chapels. Since we wanted to witness the “Botafumeiro” ritual, we also attended the 11 am Mass for pilgrims. The “Botafumeiro” is the famous big thurible or censer swung from one end of the altar to the other in the Cathedral in Santiago de Compostela. The “Botafumeiro” is said to have been used since the Middle Ages, originally to clean the air when crowds of pilgrims having completed the Camino de Santiago arrived in Santiago de Compostela after their long journey. Santiago de Compostela is quite a well-known tourist and pilgrimage destination. But let me proceed to three other Marian sanctuaries which, although not as famous as Lourdes, Fatima or Santiago de Compostela, really delighted us. I narrated in the beginning how I prayed to Our Lady of the Pillar in Morong praying for an “invitation” to her shrine in Spain. Since I was so undecided about this trip, I must confess I really did not bother to examine the details of the itinerary and was unsure if we were really to visit the Shrine of Our Lady of the Pillar or just an ordinary church in her honor. How festive was the atmosphere! The feastday also coincides with the Dia de la Hispanidad and the date of Christopher Columbus’ discovery of the New World. The people dressed up in their Spanish costumes, walking to the Basilica. The children brought flowers and in keeping with tradition, Our Lady was mounted on top of a caroza bedecked with thousands and thousands of flowers. There were songs and dances in front of this caroza, making it truly a fiesta. I remembered our town fiestas in the provinces and how this custom truly comes from our Spanish forebears. The traditional story of Nuestra Senora del Pilar (also as revealed to Sister Mary Agreda) is that Our Lady was carried on a cloud by the angels from her home to Zaragoza during the night. While they were travelling, the angels built a pillar and a miniature image of Our Lady. The Blessed Mother then talked to St. James, gave her this image and added that a church was to be built on the site where the apparition took place. The image itself is made of wood and tiny at 39 cm. The present Basilica is quite a sight to behold as it towers with elegance over the Ebro River. Our tour guide explained that during the Spanish Civil War (1936-39), three bombs were dropped on the church but none exploded. On one side, we saw the flags of nations of Hispanic colonial origin with the Philippine flag prominently displayed. Aside from being in the Basilica on her feastday itself, Our Lady of the Pillar gave us another blessing during our very brief two-hour visit. Walking to the image, we saw many people kneeling but the place in front of the Virgin was cordoned off. We could have just blended with the people but our very enterprising tour coordinator, Bro. Millard, said he would try to get us into this cordoned area. To our surprise, the guard dropped the cordon and let us in. The three of us with Bro. Millard were able to pray one decade of the Rosary. And after that, the cordon was put in place again! What a blessing from Our Lady. Earlier as we entered the Basilica, I told my daughter and my husband that we would pray for a singular intention – very important to us in our church apostolate. And I wonder: it is as if Our Lady really wanted us close so we could pray for that particular intention. Our visit to the Basilica of Our Lady of the Pillar was a brief two hours but how packed it was with color, energy – and the blessings of Jesus and Mary. 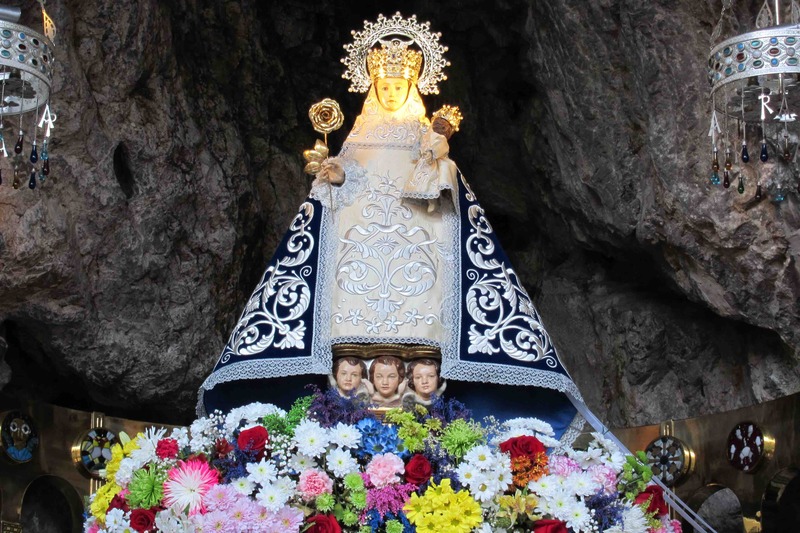 Before Zaragoza, we visited a remote shrine of Our Lady which I fell in love with. 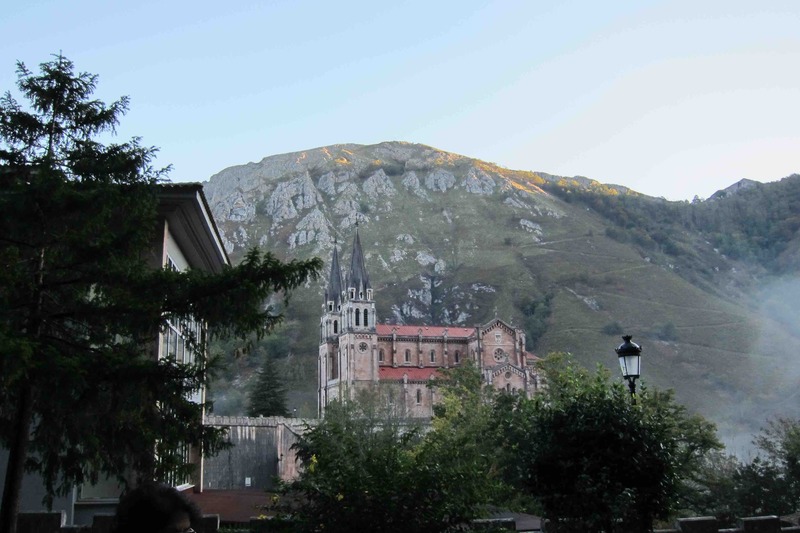 Halfway up the mountains was the Sanctuary of Our Lady of Covadonga: the Church set against majestic mountains and Our Lady enshrined inside a cave nearby. It is so picturesque, much like a postcard photo and the setting is even more unique as the tour guide said the community is populated by only around 57 people, majority of whom are priests and nuns. On top of the mountain is a Cross and we learned that the story of the place is much like Lepanto. Here in the battle of 722, a small ill-equipped Christian army opposed the Arabs. Although it took many more years to drive the Arabs away from the Iberian peninsula, the victory in Covadonga was inspirational and gave impetus to the reconquest. After seeing Montserrat in Barcelona, I gush over it saying I would love to stay there for days more, listen to the boys’ choir leisurely, explore the beauty of the mountains, pray quietly to La Moreneta (as they call the Dark Virgin) - and write about it. The trip to Montserrat (around 45 minutes from Barcelona) was, for me, the ultimate “shock” of this journey. 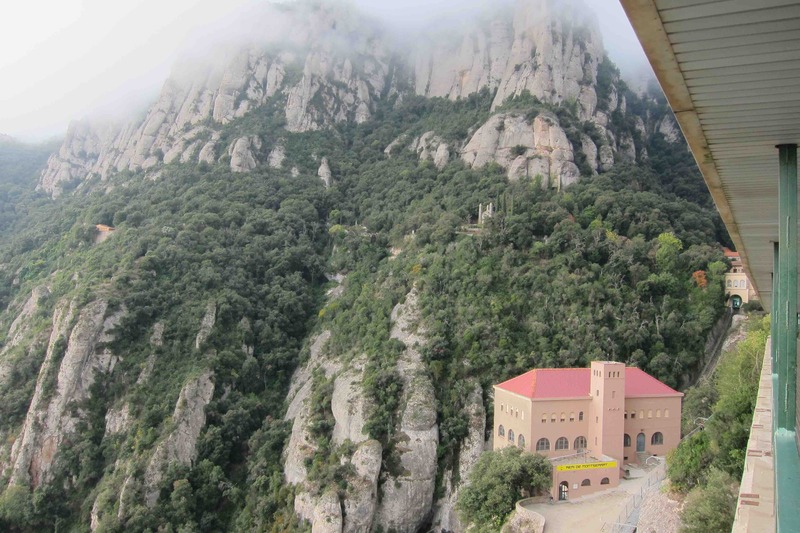 I am happy to have read so many Marian stories and apparitions – but how could I have missed Montserrat? Montserrat is the stuff of which fantastic tales are made of : breathtaking and panoramic surroundings, unbelievable characters, and a mysterious image of Our Lady found way back 880 by shepherds following a constant bright light. I am so glad Bishop Martirez gave me a book on it with so many lovely photos; the brief visit there did not really suffice. I shared the book with my grandchildren Juan Lorenzo and Ave Maria as I told them the fascinating story of St. George (very popular in Barcelona) and the Dragon. From the air, Montserrat is shaped like a Dragon and just like the Dragon of St. John’s Revelation, the Woman Clothed with the Sun has conquered the Dragon of Montserrat inasmuch as she has come to reside in the belly - in a centuries-old Basilica with the Benedictine Monastery nearby and the choir of angelic tiples (boy sopranos) providing heavenly music. Throughout our 13-day pilgrimage, we had daily Masses and I must say we had two which were the most memorable: the Mass in the grotto in Lourdes and the one in Montserrat. Once again, Bro. Millard was able to do wonders as he arranged a Mass for us right at the back of La Moreneta. The Dark Virgin sits high up the altar of the Basilica but at the back of the main altar is a chapel with a small opening from which you see the Virgin’s back. It was at this chapel that we had a memorable Mass in Montserrat. Because of the crowds of people at the Basilica, we were instructed that the Mass should be very quiet – thus no singing. Aside from the significant venue, what made this Mass memorable is that towards Communion, Bishop Martirez asked us to gather closely around him in the altar. We were then given precious minutes of silence to pray to the Eucharistic Jesus for our intentions. That was really very touching. Montserrat is for both tourist and pilgrim. Thus, if you go to Spain and miss Montserrat, I would tell you – what was the point to your visit there? It is Jesus who calls! There were other places we visited like Madrid, Lugo, and Salamanca but the ones I mentioned are those which made the greatest impact on me. What I must share also is that I am grateful for our daily Masses in shrines along the way. I believe it is Jesus in the Eucharist who directed everything: gave us good weather, gave us strength for the journey, gave us the companions, tour Coordinator and Chaplain whose personalities would blend, and added the “bonuses” like the special venues for the Masses and our special roles in Lourdes and Fatima (some in the International Rosary and the others as readers in the Masses). Even after the pilgrimage when we proceeded to Italy, the effects of the tour lingered on. As my daughter and I went through the crowded streets of Florence, Cremona, Siena, and Milan, we would occasionally sing that Fatima refrain “Ave, ave, ave Maria!” It kept us in the right perspective especially of remembering Our Lady wherever we go. We look back to this particular pilgrimage with fond memories and warm hearts. It is not only the pleasure of having visited those places in Europe. 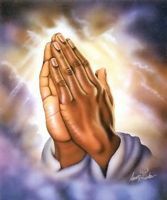 More, for me it is like having answered the Lord’s call to venture out there accompanied by Him. To get out of my comfort zone in faith and courage. To see more of His creation and gaze at it with wonder. As what happened when, as we passed the Pyrenees Mountains, we simply burst into that song, “How Great Thou Art”. We looked at the Pyrenees in “awesome wonder”, a tiny fragment of His “power throughout the universe displayed”. As I narrated my travels to my son and daughter-in-law who dream likewise of travelling, I advised them to always start with a prayer. Because in a pilgrimage, it is Jesus who calls. And when He calls – whether to join a pilgrimage, to go to daily Mass, to spend time in the Adoration Chapel, or to say the Rosary - you respond.